In 2011 Honours Ice Cream were hired for filming a TV advertising adverts for the Bloomberg TV Channel that covers stocks and shares. We were booked to take part in a film shoot next to a local park around Peckham South London. The advert has a simple humorous message showing a City stock broker trying to hold down a second part time job selling ice cream ” ice cream van sales” making some extra money to keep his head above water because of the economic downturn. The suited ice cream vendor is shown cleaning down his ice cream van then trying to get a hang of pulling soft ice cream to waiting customers before driving off to his next stop. From all accounts this advert is now showing on the TV Channel but I have not yet seen it. We were also hired to take part in a BBC drama that is to be screened some time in 2012, the name of this drama is called “One Night” I am not sure if the clip with the ice cream van will be used but the story line is supposed to be very good and will be screened on prime time TV. 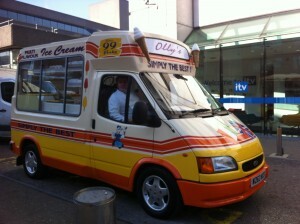 Honours ice cream van hire season had come to an end late November 2011. Surprisingly the weather within the coming months November, December and January was extremely mild which gave us a false sense of feeling. We half expected the mild weather may continue throughout February and we may miss the usual low temperatures we are so used to. Early February we were booked to take part in a few small film parts, one in West London and the second close to central London. Both bookings were soon to be postponed because of heavy snow. After five or six days most of the snow had cleared but the freezing temperatures would soon return. The bookings were both re scheduled and within a week we made our way to both venues. For the first time in twenty years I had to remove ice chunk’s the size of ice cubes out of the scoop water and within a few hours the ice had once again reformed! We seemed to be the only ice cream vendors visible throughout our travels across central and west London. Once the snow disappeared we were soon to face harsh freezing day time temperatures dipping as low as minus ten degrees. The cause for the deep chill and snow across the UK was due to weather travelling from Siberia, the bitter cold lasted for a couple of weeks.